Top Dallas bartender Fernanda Rossano isn't afraid to get spicy when mixing drinks, as she demonstrates in this episode of Old Forester's Cocktail Chronicles. Rossano adds a kick to the classic old fashioned with citrus and not one but two chile-based ingredients. Watch how she does it before tackling the recipe below, and be sure to keep plenty of ice on hand. 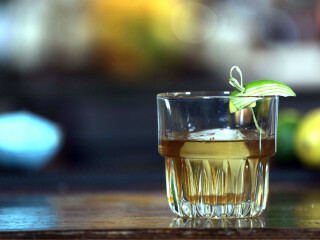 Combine bourbon, chile syrup, bitters, and lime and lemon peels in a mixing glass and muddle. Add ice and stir until the cocktail is properly diluted. Pour over a large-format ice cube. Sprinkle red pepper flakes on top of ice cube, and garnish the drink with lemon and lime peels.